For those of you still using PowerShell ISE, I know the news about Microsoft no longer actively developing the ISE was sad. The good news is that it’s been replaced by something WAY cooler: VS Code. VS Code is free, open-source and a joy to use. If you’d like to make the move, or if you just want to see how PowerShell Pros use VS Code, Rob Sewell will be presenting an hour long web session today for 24 Hours of PASS Summit Preview at June 12, 2018 at 20:00 GMT. I use Google to help me convert and it seems that 20:00 GMT is 3:00 PM New Orleans/Central, 22:00 Brussels/Paris and 01:30 Wednesday in New Delhi. But please check using Google or this converter to be sure. Abstract: We should be using VS Code to write our PowerShell code. 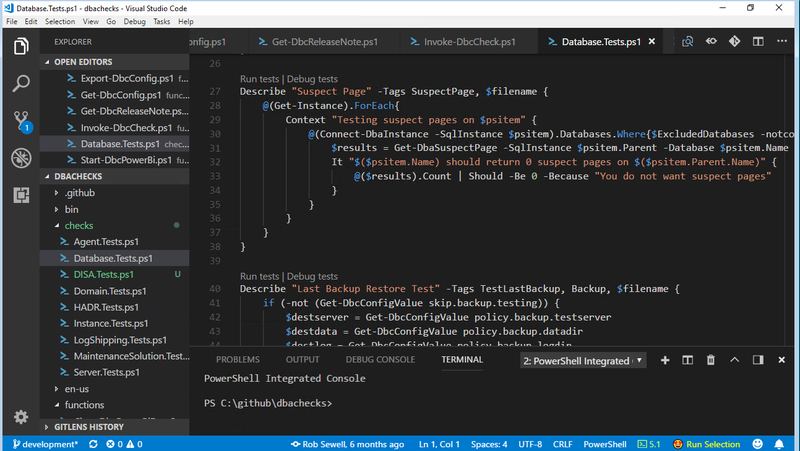 In this presentation I will show you how to set up VS Code, which extensions I use, and some of the features that make writing PowerShell easy using VS Code. Rob is a fantastic trainer with a super cool English accent and VS Code is the future. Don’t miss this session 😁.